Bridgeport's 735-SP Nail Plates are now available! Bridgeport's 735-SP nail plates are US Made in our Stratford, Connecticut facility and are a full 5" long for greater coverage. They meet NEC Article 300.4(A)(1) and (A)(2) and are galvanized for superior corrosion resistance. They won’t rust on the jobsite or in your van. 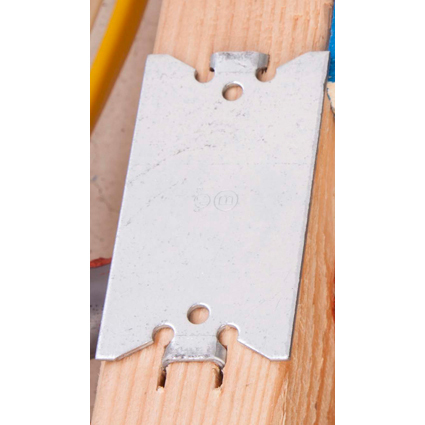 Bridgeport's nailplates are great for protecting conductors, cables and raceways. And they are UL Listed! Other Products by Bridgeport Fittings, Inc. Easily connect between mounted enclosures with Bridgeport Mighty-Align Slip Connectors! Suitable for equipment grounding and bonding. The Mighty-Align’s built in sight window ensures proper installation every time. Features zinc plated steel construction and deep-slot, tri-drive screws. Patented. Available in ¾, 1 , 2, 3 and 4 inch trade sizes. Patented. cULus Listed. Push-on Grounding Bushing – 2017 NECA ShopStopper Winner! Bridgeport’s ‘Armored Cable Productivity Kit’ has everything a contractor needs to connect and support branch AC and MC Cable. Each kit contains (25) E-Z Lock™ AMC-50QI Cable Connectors, (25) US-4461 Universal Straps, and (30) 3/4-inch Wafer Head Screws. Products in the MC-EZ-PAK are cULus and cETLus Listed. Short on Threads? Go Long. With Bridgeport's extra-long raintight connectors, you'll have more than enough thread length to accommodate both a locknut and a grounding bushing on thick walled enclosures. Available in 1/2", 3/4" and 1" trade sizes. cULus Listed. Go long and shorten your installation headaches.